We offer extraordinary ninja experience in Kyoto. 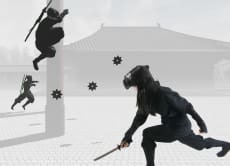 You will not only get to learn Ninjutsu with real ninja weapons but also enjoy VR ninja experience to practice your skills. Please join us to enjoy and experience the latest VR technology only available in Kyoto.